Mana Pools is a wildlife conservation area centered around four large permanent pools. The designated site consists of three different areas: Mani Pools National Park, and the Sapi & Chewore Safari Areas. All are situated in the Zambezi valley, along the Middle and Lower Zambezi river and near the border with Zambia. The river and the sand-banks that are formed by erosion and deposition is the key to the exceptional natural value of these areas. On the riverine strip, large groups of animals congregate annually during the dry season when water elsewhere is scarce. The area is one of the three most important refuges for black rhino in Africa. Also, over 6.500 elephants, 11.000 buffalo, lions, hippos, crocodiles, leopards and cheetahs live in these protected areas. I went to Mana Pools in December with my brother, who lives in Zimbabwe. It was one of the most beautiful places I have ever been, and the experience was enhanced by seeing the rare & elusive painted hunting dogs, and also lions, elephants, hippos, crocodiles, hyenas and other species of animals and birds too numerous to mention. The experience of living for five days in such an utterly wild place, sleeping outside with the sound of roaring lions, whooping hyenas and grunting hippos to lull me to sleep, and spending the days surrounded by such stunning scenery, is one I will never forget. Difficult to get a place in a lodge unless you know a Zimbabwe resident (& even then not easy), but there are campsites open in the dry season, and it's well worth visiting if you can find a way. World Biosphere Reserves: 2010 - "Middle Zambezi, Zimbabwe, stretching over some 40,000 square kilometers in the Zambezi valley, features unique riverine and terrestrial ecosystems, including a large human-made reservoir, Lake Kariba. 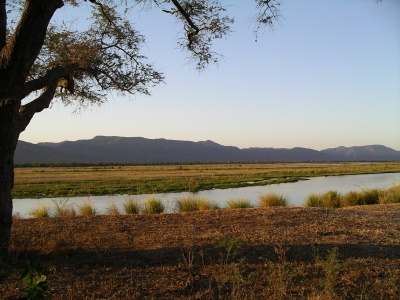 The Mana Pools National Park, part of the core area, is a UNESCO World Heritage Site."